You can come see where it Happens! Head to the farm in Capay! Get to know your farmer, harvest your own fruits and veggies, ride the tractor-tram, picnic near the fields and participate in our fun farm activities! Farm Talk with your Farmer–Get to know your farmer! Meet us at the lower event site at noon. Thaddeus and Brendan will share tidbits about Farm Fresh To You, organic produce and sustainable agriculture. Get your questions answered! Kids’ Activities — We will have tractor-tram rides every 15 minutes touring you around the farm. The Esparto/Capay 4-H Club will have a mini petting zoo set up and we will also have a face painting booth! Organic Market Stand — Our Farm Fresh To You Market Stand will be selling seasonal, organic produce as well as fun Farm Fresh To You swag! Pick up a canvas tote featuring one of our favorite fruits/vegetables and load it with seasonal produce. Tasty Treats — Tacos 911 will have authentic, Mexican tacos available for purchase. Luciano’s Scoop will be selling their artisan gelato, The Rustic Puff will be selling their homemade marshmallows, and Pachamama Coffee will be serving up hot coffee and cold brew. We will also have Township Valley Farms selling their homemade pesto, and Capay Valley Ranches offering premium olive oils. $5 per adult | Children 12 and under FREE! No RSVP necessary for Farm Tours. Just come out and have fun! This entry was posted in Corporate Green, Events, Garden /Plants, Health and Beauty and tagged Capay Organic Farm, Farm Fresh to You, Farm Talk, Farmers, Food, Kids Fun, market, open house, Tasty Treats on March 1, 2017 by Jacqueline Smith. Sun Basket—the USDA certified organic meal kit service that delivers the ideals, flavors and freshness of California’s food culture straight to your table—expands nationwide. Founded in San Francisco and with deep Northern California culinary roots, Sun Basket is the only service of its kind with a James Beard Award-winning chef at the helm, developing every single recipe and ensuring they’re responsibly sourced, delicious and take less than 30 minutes to make. New Parent Survival Strategies: No time to shop and prep? Count on Sun Basket to deliver healthy and balanced meals for busy new parents. Get (and Stay!) in Shape Bride: In a recent survey of its users, Sun Basket found that a majority of customers report that they are cooking healthier meals, feeling healthier and eating more fresh produce, while many report losing weight as well. From Paleo and Vegetarian to Gluten-Free, there’s a menu to suit all healthy eating plans. Easy Summer Entertaining: Create a new twist on summer entertaining with Sun Basket’s fresh and seasonal recipes. Grab some friends and follow along with the recipe cards for low key summer dinners. Weekend Warriors: From Tahoe to the Hamptons, take Sun Basket on the road for stress-free and delicious weekend meal planning. Power Up Your Breakfast: Discover new ways to cook with chia, and favorite no-cook breakfasts like overnight oats and smoothie bowls. The Data Driven Chef: Only someone who has worked in restaurants would say tech startup life is saner. Sun Basket Executive Chef Justine Kelly shares more about the opportunities that technology has opened up for her. Father’s Day Gift Guide: The perfect gift the whole family can take part in. Treat your father to the perfect home cooked meal that is as fun and easy to make as it is nutritious and delicious. Together with a culinary and nutrition team hailing from Northern California’s most influential food institutions, Chef Justine Kelly develops nutritionally balanced, nourishing recipes free of hormones, GMOs, preservatives and artificial flavors using only the highest quality organic and sustainable ingredients sourced from the West Coast’s best farmers, ranchers, and fishermen. From morning to night, Sun Basket takes the stress out of mealtimes with simple-to-follow chef-developed recipes and flexible meal plans that include Paleo, Gluten-free, and vegetarian options. Sun Basket is the only service of its kind to offer 5-minute healthy breakfasts as part of the regular subscription–a perfect option for when you’re too busy to cook three dinners per week. Committed to reducing food and packaging waste, Sun Basket uses pre-measured ingredients, 100% recyclable packaging, and sauces made with “ugly produce”. Leftover ingredients are never thrown out: Sun Basket makes them available to employees at weekly “farmers markets” and donates the rest to local food banks. Founded in San Francisco in 2014 by Webby-winner Adam Zbar and San Francisco’s James Beard Award-winning Chef Justine Kelly, Sun Basket is an innovative healthy cooking service, which delivers the best organic, pre-measured ingredients and easy-to-cook, delicious recipes weekly to your door. Sun Basket saves busy people the time of planning and shopping so they can focus on the fun part of cooking and enjoying the meal. Personalized for your lifestyle and diet, Sun Basket provides a seasonally inspired Chef’s Basket, along with Gluten-Free, Paleo and Vegetarian meal options. Located in San Francisco, Sun Basket is backed by top-tier venture capitalists including the investor behind Instagram. Celebrity Chef Tyler Florence acts as Culinary Co-Founder, and is joined by COO/Board Member, Don Barnett, Co-Founder of organicgirl produce. For more information, please visit https://sunbasket.com or on Facebook, Instagram, Pinterest or Twitter. This entry was posted in Food, Health and Beauty and tagged chef, Chef Justine, cook fresh, cooking techniques, culinary, eat fresh, Food, fresh, James Beard, organic meal kit, prepared meals, seasonal, Sun Basket, time saver on May 24, 2016 by Jacqueline Smith. Stomach Ache- won’t go away? I love to hike, I’ve drinker water from streams. I bet you may have too. After 2weeksof mind-bending pain … A blood test reveals I have been exposed to H. Pylori. Good News! Not an ulcer; and Treatments are available. Infection with H. pylori is common. About two-thirds of the world’s population has it in their bodies. For most people, it doesn’t cause ulcers or any other symptoms. If you do have problems, there are medicines that can kill the germs and help sores heal. As more of the world gets access to clean water and sanitation, fewer people than before are getting the bacteria. With good health habits, you can protect yourself and your children from H. pylori. For decades, doctors thought people got ulcers from stress, spicy foods, smoking, or other lifestyle habits. But when scientists discovered H. pylori in 1982, they found that the germs were the cause of most stomach ulcers. After H. pylori enters your body, it attacks the lining of your stomach, which usually protects you from the acid your body uses to digest food. Once the bacteria have done enough damage, acid can get through the lining, which leads to ulcers. These may bleed, cause infections, or keep food from moving through your digestive tract. If you don’t have symptoms of an ulcer, your doctor probably won’t test you for H. pylori. But if you have them now or have in the past, it’s best to get tested. Medicines like nonsteroidal anti-inflammatory drugs (NSAIDs) can also damage your stomach lining, so it’s important to find out what’s causing your symptoms so you can get the right treatment. This entry was posted in Health and Beauty and tagged burning pain in your belly, clean water, Food, H. pylori, illness, Peptic Ulcers, stomach, stomach lining, ulcers, water on October 2, 2015 by Jacqueline Smith. Small batches, made with pride, local favorites…. like this pickle-loving business. Grow yer Own, garden stores, How To Books, community gardens, New magazines to enjoy, collectives and gardening events just like these! Superfoods — there are long lists now….. coconut oil and recipes, 101Cookbooks.com has so many more great recipes from amaranth to kale to sweet potatoes and more. Look in the search bar of GREENEROO there are 1000 articles for you to enjoy. This entry was posted in Corporate Green, Food, Garden /Plants, Global Understanding and tagged Big Food, colconut, consumer power, FBS, Food, food safety, gardens, grow, kale, planting, recipes, small green changes on June 20, 2015 by Jacqueline Smith. At Uncharted, new ideas are viewed through the diverse lens of over 40 prominent thinkers representing technology, science, culture, politics, education, economics, the environment, food and all aspects of our lives. There are no “talk-to-you” lectures: at Uncharted stimulating conversations and creative exploration dominate, and participants are encouraged to participate. This interaction goes even further in “Uncharted Lab” sessions when collaborative brainstorming as a group is the format. And attendees are challenged to consider bold provocative new concepts by speakers during “Mind Bomb” presentations. Northern California’s Bay Area is renowned as a hub for creativity and innovation, making it a natural place for an annual gathering of exceptional thinkers who push boundaries and ask questions. 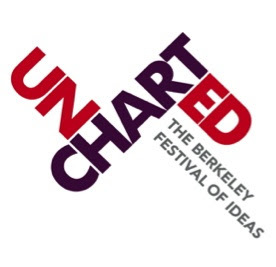 Uncharted, which launched last year and is produced by Berkeleyside, Berkeley’s independent news site launched in 2009, grew from Berkeley’s well-known tradition of challenging the status quo while looking toward the future with optimism. Uncharted evolved out of the belief that the most intriguing ideas – and solutions to today’s big challenges – emerge from the collision of different visions and perspectives. The 2014 Festival represents the blossoming of this concept. The Uncharted Festival takes off in downtown Berkeley’s Arts District on Friday, Oct. 24, and lands that evening at a bash in UC’s exclusive University Club, high atop Memorial Stadium. Sessions resume on Saturday, culminating in the closing session on Sunday afternoon. Tickets are now on sale, with an “early bird” special price of $290 available for a limited time. The price includes both days of programming plus Friday evening’s gala. One-day passes are available for $205, also including the gala. To purchase tickets, see the complete list of speakers, and find out more information, please visit www.berkeleyideas.com. Who is headlining at Uncharted? A few of the speakers include: Nobel laureate in Medicine and Physiology Randy Schekman, composer John Adams, food poverty campaigner Saru Jayaraman, aging expert Laura Carstensen, Go the F*** to Sleep author Adam Mansbach, and marriage equality pioneers Kris Perry and Sandy Stier. See the full speaker list. The speaker line-up at Uncharted is carefully curated and diverse, featuring innovators talking about their pioneering work in variety of fields – the environment, food, science and technology, social policy, activism, politics and the arts. Sessions are one-on-one or one-on-two conversations with ample opportunity for audience Q & A. The Uncharted Lab is a series of engaging, interactive workshops and exercises where attendees grapple with questions and search for solutions, orchestrated by Jump Associates, a strategy and innovation firm. “Mind Bombs,” similar to TED presentations, are short, sharp injections of provocative ideas. At the Friday evening gala, the halfway point in the Festival’s schedule, events will relax even further taking on a party atmosphere as festival-goers mingle with each other and with speakers at a special gala at the VIP University Club, perched on the highest level of Memorial Stadium. There will be tasty locally sourced food and delicious wine and beer. What’s on the program at Uncharted? Can art bridge social and political divides? Will data swallow all our freedom? What is the vision for Uncharted? Uncharted aims to be one of the world’s leading ideas festivals along with TED, the Aspen Ideas Festival, London’s FutureFest, and Sydney’s Festival of Dangerous Ideas. Uncharted is produced by Berkeleyside, Berkeley’s independent news website. One of Berkeleyside’s founders, Lance Knobel, has a wealth of experience organizing some of the world’s major business and political meetings. He was Director of the Program for the renowned World Economic Forum Annual Meeting in Davos, and has been responsible for the programs of The New York Forum, the APEC CEO Summit, and The New York Times’ DealBook Conference. Sponsors for Uncharted include Autodesk, Cloudera, DeYoeWealth Management,Berkeley Repertory Theatre, GreenerPrinter, University of California Berkeley, Berkeley Startup Cluster, Downtown Berkeley Association, and KQED. Visit the Uncharted website (www.berkeleyideas.com) for more information and to purchase tickets. Watch Video from Uncharted 2013 and hear more about the festival. Follow Uncharted on Facebook; and on Twitter (@UnchartedIdeas) to keep in touch and for program updates. This entry was posted in Events and tagged arts, Aspen Ideas Festival, Autodesk, Berkeley, Berkeley Repertory Theatre, Berkeley Startup Cluster, Berkeleyside, Cloudera, culture, DeYoeWealth Management, Downtown Berkeley Association, Food, greenerprinter, ideas, innovation, KQED, Lance Knobel, London’s FutureFest, politics, science, startup, Sydney’s Festival of Dangerous Ideas, synergism, technology, TED, thinkers, Uncharted, University of California Berkeley, World Economic Forum on July 15, 2014 by Jacqueline Smith. Dr. Neal Barnard is one of America’s leading advocates for health and plant-strong nutrition. He is president of the Physicians Committee for Responsible Medicine, and an Adjunct Associate Professor of Medicine at the George Washington University School of Medicine. Neal is the author of more than 60 published research papers on nutrition and its impact on human health, and of 15 books, including Power Foods for the Brain and The 21-Day Weight Loss Kickstart. He will show you how a healthy diet can give you a stronger immune system, more energy, and better memory and sleep. Find out more about Neal’s work by clicking here. Meat-Eating is a Risk Factor for Developing Diabetes, February 21, 2014 . No wonder our meat eating habits in the last few years are lessening by about 1% a year. This entry was posted in Food, Garden /Plants, Health and Beauty and tagged diabetes, Dr. Neal Barnard, Food, plant based diet, Power Foods for the Brain, vegan on April 30, 2014 by Jacqueline Smith. Dr. Rucha is a long time practitioner of Ayurveda and yoga, she has insightful messages to share that will help us de-stress, and learn more about the time-honored techniques of Ayurveda. ** Contact information, and for more information! This entry was posted in Events, Food, Health and Beauty and tagged Ayurveda, Dr. Rucha Kelkar, Food, physical therapy, Prajna Yoga, stress relief, Yoga on April 20, 2014 by Jacqueline Smith.